Our heavy duty Dock Cleats are made from hot dipped galvanized iron for corrosion resistance. Rugged construction makes them perfect for docks, fishing boats and workboats. The large open base is designed to easily handle multiple dock lines and distribute heavy loads. Most cleat sizes have recessed sockets for round head bolts. WC401G4 OPEN BASE CLEAT GALV 4 IN. WC401G5 OPEN BASE CLEAT GALV 5 IN. WC401G6 OPEN BASE CLEAT GALV 6 IN. WC401G8 OPEN BASE CLEAT GALV 8 IN. WC401G10 OPEN BASE CLEAT GALV 10 IN. WC401G12 OPEN BASE CLEAT GALV 12 IN. WC401G14 OPEN BASE CLEAT GALV 14 IN. WC401G18 OPEN BASE CLEAT GALV 18 IN. 6" CLEAT HEIGHT IS 1"
Distance from base of cleat to top of hole is 3 1/2 inches. 8 inch galvanized open base cleat. What is the center to center mounting measurement. 1 5/8" CENTER TO CENTER. It depends on the desired cleat size, the bigger the cleat size, the higher the height. I have a 21 foot pontoon boat and the lake is relatively calm. What size dock cleat makes sense?Also I assume galvanized is best? A 6" dock cleat would work well. this appears to be black in color. Is that an accurate picture? No, they're metallic. Standard galvanized metal color. Even 3 1/2 years later. No. It is a galvanized silver color with a dull finish. No it is galvanized which is a silver color. They are my cabinet pulls. Mine were not black, they're galvanized color. Can I use these as dresser drawer pulls? Sure, but kind of clunky. May have to grind or file mating surface smooth so it fits the drawer surface nicely.. They could be used for drawer pulls if you are shooting for a very raw, industrial look. Thank you for all of your great answers! Yes, I used these as pulls on a dresser and they look great. You should be be able to just unscrew the lag bolts. Is there something else you are planning to do after removing the cleats? With a socket wrench. Although you may need an extension to get into the cleat. Machine shops use a tool (easy out? )to remove broken bolts that looks like a tapered spiral drill. Not sure if name is right but you must drill a hole down the center of the bolt then insert the easy out in the hole and turn. Trick is, the easy out is tapered and the spirals go in the opposite direction of a normal thread so.. when you tighten the easy out turning counter-clockwise it should loosen the bolt. Easy outs come in all sizes and any good tool supply shop should be able to help you find the right size. Not very expensive either. Good luck! I am looking at the 8&quot; cleat. Would a 5/16&quot; hex head bolt work on this. The image shows a hex head but the specs call for a round head? Do you have this cleats in 22&quot;? ?what is the price?? I purchased the 4-inch cleats for a small project. The 4-inch cleats work well for my individual needs. I can't imagine using 22-inch cleats. I need to install 14&quot; cleat on the dock for my boat. What other parts do I need to purchase to install this cleat? What tool do I need to use? Thanks. I'm sorry, I thought they were 4&quot; boat cleats not 14&quot;&quot;!! Just make sure to use S.S. bolts, SS teflon lock nuts and SS flat washer for a boat or just SS wood screws and washer for a deck. The side is probably 1/4&quot; to 3/8 x whatever length plus washer and nuts. (2 of each)S.S. Screws( #10 x whatever length needed ) #10 SS Teflon lock nuts and SS #10 flat washers. Very good traditional cleat. Well covered with zinc. A bit ragged on the edges, as expected. Cleats look great on my white kitchen cabinets! Several are a bit rough, but that really doesn't get in the way of their perfect use as kitchen hardware! I used this product on a dock to tie up vessels of less than 8,000 lbs in a bay that has a tidal rise/drop in the vicinity of 15 feet. If you are going to use this product for larger vessel I highly recommend a backing plate (distribute loading) at a minimum of 1/4" galvanized steel plate at least 8 to 12 inches wide and up to two feet long. If you use stainless a 7ga piece of the same above dimensions should be satisfactory. The product itself is a rough poor quality casting that isn't of any precision quality. But it really isn't necessary. The frustration I had was the bolt holes may have been metric as a 1/2" bolt is a sloppy fit and a 5/8" bolt would not fit. If I could have found a 9/16" galvanized bolt It may have been the ticket. (Hole had slight taper in it) It would be nice if the supplier sold this as a kit with a choice of fasteners (mostly bolt lengths). This product was not a gift nor was I compensated for these comments. JD sent this right out. I would give a 5.0 for delivery but that isn't an option in this review. 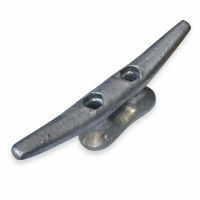 Dock Cleats Galvanized Iron Open Base. We used these to tie back cords on blinds. Looked at more expesive products and decided to go with these. Not as attractive as more expensive but we still like them more than ties that came with the blinds. I am going to use as hooks in a mud room in our summer home..They are perfect!